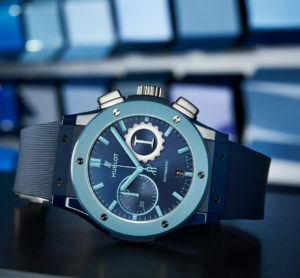 Behind this gentle blend of cool blues burns an ardent artistic collaboration between Garage Italia and Hublot. This marks the start of a brand new collaboration with no shortage of projects for the future, and the first of a three-part concept entitled “Sky, Earth, Sea”. Enthusiasts will recognise the idiosyncratic style of Lapo Elkann and the innovative approach of the Haute Horlogerie brand, fused within a diameter of 45 mm. This collector’s timepiece will be available from May 2019 in a limited edition of just 100 pieces. What challenge could be more inspiring for these pioneers of style and performance than conceptualising the immensity of the sky, the earth and the sea? 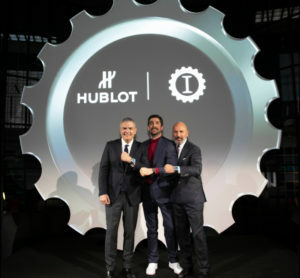 Hublot and the Italian design team have completely revamped the chronograph movement, adorning it with the signature symbols of the Milanese brand. Encircled by the first ever bezel in sky blue ceramic, the dial wraps the Italian logo in undulating shades of azure that recall the deep waters of far-flung archipelagos. 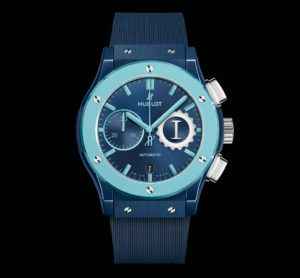 The ceramic case, decked out entirely in Garage Italia blue, complements the full rubber strap finely patterned with imaginary ocean waves. Who better to evoke the theme of the elements than Lapo Elkann, his team and their ideas lab, a custom shop where style meets the transcendence of movement in the ceaseless pursuit of perfection. Exploration, innovation and technological feats galvanise and attune the innate passion of these two partners driven by the challenges they constantly address, and in which they love to lose themselves.